Slender model in custom fit jeans. Custom-fit jeans are specifically tailored for an individual person. Custom-fit jeans can be made with a specific inseam. A woman wearing custom-fit jeans. Custom-fit jeans are made or tailored to fit a person's body. Custom-fit jeans are tailor-made for an individual person by an individual or a company. A customer can choose the fit and style of the jeans and can provide his or her exact measurements so the jeans fit perfectly. 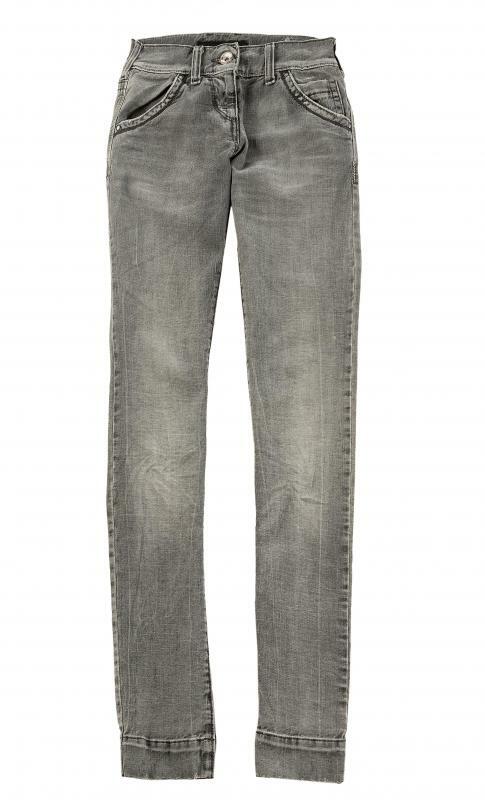 These jeans can also be designed with different material, washes and details. While they can be more expensive than their mass-produced counterpart, many customers with unique body types have found them to be worth it. Customers can choose several different options when designing custom-fit jeans. The rise of both the front and back of the jeans can be altered, improving the way a person looks in his or her jeans. Customers can also often choose whether they would like the jeans to fit tightly or loosely, and the style of the leg of the jean can also be customized. Typically, a customer can choose boot cut, flare or skinny. Straight, tapered or wide leg are additional options when designing custom-fit jeans. Perhaps the biggest draw of custom-fit jeans is the ability to use a person's specific measurements so the jeans fit perfectly. Customers typically need to provide the company producing the jeans with their hip, thigh and waist to knee measurements. Unlike mass-produced jeans, custom-fit jeans can be made with a specific inseam; this can be especially useful for very short or very tall individuals. The type of material used to create the jeans can also be chosen. The most common options are denim or denim with stretch added for a snug fit. When creating custom skinny jeans, customers may have the option of choosing a stretch fabric that looks like denim but fits like stretch cotton or spandex. Companies offering custom-fit jeans often provide a multitude of different washes. Options range from white or colored to nearly black jeans. Customers may also pick what kind of whiskering or distress they would like on the jeans. This includes the color and style of these options as well as their placement. Custom-fit jeans provide customers with the ability to choose different details in their jeans other than cut, fit and color. The type and shade of thread used in the jeans is often an option. Different styles of buttons, zippers and other hardware is typically customizable. In many cases, a customer may be able to pick the amount and type of pockets on his or her custom-fit jeans, including size and placement. As these types of jeans are custom-made upon order to exact specifications, they are often more expensive than the jeans found at retailers. Despite this, custom-fit jeans can be found at prices cheaper than high-end, designer jeans. Once an order is placed, it can take a few weeks for a person to receive his or her merchandise; when purchasing custom-fit jeans from a tailor, this may take longer. How Do I Choose the Best plus Size Skinny Jeans? What Are the Best Tips for Choosing Short Jeans? How do I Choose the Best Tall Women's Jeans? I don't want to wear "skinny jeans" at all, but I would like to get a custom fit jean that fits better in the rise. I have lost some weight in the past few years and I want to have some casual clothes that show it off. Most standard jeans sag a little in the seat, I think. I think I would benefit from ordering a pair or two of custom fit jeans. I have a normal waistline, but fairly short legs. If a standard pair of jeans fits well in the waist and hips, then the legs are usually too long. If the length is right, then the jeans won't fit right in the seat. I either have to wear a belt or hire someone to taper the legs. I realize it might more expensive up front, but I get tired of shopping for jeans and not finding anything in my unusual size.